Is everything you’ve heard about the car true? 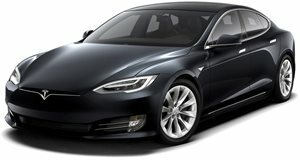 The Tesla Model S is supposed to be the car of the future. Not so long ago, electric cars used to be prison sentences that were about as fun as the dentist’s office, but the Model S has forever changed that perception. It shows us gearheads that it really is possible to have fun behind the wheel even when a gasoline engine is not involved. Recently, CarBuzz was invited out to Tesla headquarters to drive the famed Model S, and these are some of the things that we learned about the future by driving the car of the future. 1) Gasoline cars have one big weight disadvantage: the engine. Whether it sits in the front or at the rear, a car’s engine provides a big hunk of metallic mass that must be worked around. Electric cars must also lug around heavy motors, but they have the added handicap of batteries weighing them down. Tesla helps mitigate the effects of the weight gain by placing the batteries in the floor, lowering the car’s center of gravity and drastically changing the character of the car. Behind the wheel, a driver easily feels the 4,608-pound mass of the car, but unlike cars of similar mass, the weight feels planted like a linebacker. With 328 horsepower going to all four wheels, the acceleration is quick enough to mask some of this, but the corners coax out the lardy feel. 2) Which brings us to the second lesson: the Model S, and hopefully all future EVs can corner like a pro. All of that talk about a low center of gravity comes into play here. Even though pitching the Model S into a corner feels like trying to turn a shipping barge on a dime, it can actually pull off the maneuver with reflexes that are uncommon in this weight class. Spirited driving on curvaceous roads is made easy with good cornering grip, a height-adjustable suspension system that leans into the corners, and an authoritarian stability control system. All of these serve to raise driver confidence and put a smile on the faces of owners who passed up a sports car for a more practical Tesla. 3) One of the things that's easy to get used to is driving the car with a single pedal. An adjustable regenerative braking system completes this task by exchanging speed for energy that goes back into the battery. Using this, a driver can juggle acceleration and braking using the gas pedal alone, and this makes a huge difference. We prefer the old school three-pedal setup, but for the sake of simplicity and fun, using a single pedal to drive is more fun than a standard automatic system. Once you go regenerative braking, you don’t want to go back because the two-pedal setup suddenly feels as archaic as a hypothetical car where there is one pedal for each drive wheel. 4) Following this spirit of reduced driver effort, our Tesla came loaded with Autopilot. After a few 5.2-second rushes from 0-60 mph, we decided to give it a shot. In doing so, we learned that the future will be littered with more funny autopilot reaction videos because we couldn't help but scare ourselves. The system recognizes what the speed limit on a certain highway is, and interestingly enough, proceeds to go 9 mph over that. At first, we thought that the Model S was just speeding cleverly (10 mph garners a ticket in most states), but in hindsight it makes sense because usually everyone is exceeding the speed limit. The system likely doesn't abide by the law because it is dangerous to putt along the highway while other cars careen past. 5) The selling point for the Model S is the technology, cool factor, and the ability to turn your nose up at Prius owners, but this means that the interior isn’t exactly a special place to be in. The large iPad screen in the dash was the center of focus for the interior decorators and made it so that the rest of the inside felt a bit underwhelming despite its $95,000 price tag. A lack of cup holders in the back lends a clue to just how high the interior was on the priorities list. This is a finicky thing to pick out about an otherwise great car that comes loaded with groundbreaking technology, but when the newness of the Tesla tech wears off buyers will notice. Especially buyers shopping in the $100,000 price bracket. Photos by Alden Tatum.